If that’s true — and corroboration would be welcome from anyone with working knowledge of this stuff — it’s an object lesson in statistical analysis. Land mines are everywhere! 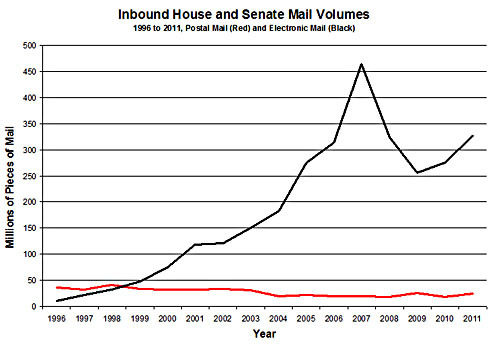 If you saw this chart and concluded, say, that the financial crisis had somehow wiped out people’s desire to email their congresscritters, and then built an elaborate theory around that guess, you’d be totally wrong. It would be a perfectly reasonable theory, but it would be wrong. In reality, nothing interesting happened at all. Caveat emptor.